A lot of people think that to spend quality time with someone there needs to be fanfare or some big, out of the ordinary to-do around it. 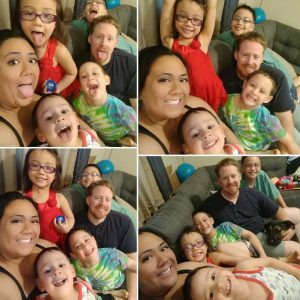 In reality, while those big adventures and parties are fun, it’s the small, everyday type things that will leave the biggest impression in your family. How about an activity that gets your house clean too? To make it more fun for us, we make a race out of it. I wash the dishes (by hand) fastest in the whole family. So our race is: Can we get the table, chairs, floor, and kitchen clean before Mommy finishes the dishes? Of course I will never win because everything that needs to be cleared off the table and counters are dishes, right? 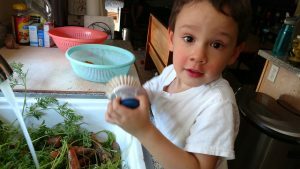 But it doesn’t stop the kids from quickly, but carefully, bringing the dishes to me so they can quick wipe down the table and counters while I’m washing! It doesn’t hurt that the winners get a little sweet treat for dessert. I love me some arts and crafts! This activity presents a fabulous opportunity to share art with each other. This is a great activity because art is a very vulnerable activity. When we do projects together, it’s not just fun to see the project come together. And it’s more than oohing and aahing at each other’s creations. 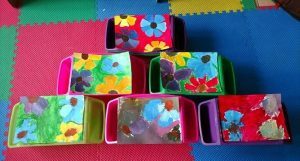 It gives your kids a chance to express themselves freely as well as learn to respect each other’s creations and artwork. I teach my kiddos that art will look different from each person. So when someone works hard at their creation, we make sure we respond with positivity and respect. My kids learn to appreciate the differences in their art and to restrain from making comments like “your project was done wrong” simply because it doesn’t look the same as theirs. For some great projects to do together, check out the projects page here! Music heals the soul, warms the heart, and strength the family bonds. Especially if we’re all dancing like fools and Mom and Dad bust out the hip dance moves of the eighties… or at least try to! haha!! This activity gives you the chance to let it all loose. Ask your kids how they feel about the day in general. If it’s been a trying day and frustrations are running high, a loud, hand banging kind of song might be the perfect way to let it all out. 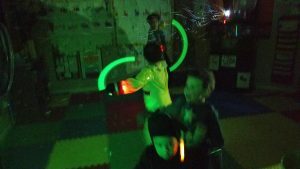 We’ve added some twists like running a bubble machine while dancing, encouraging interpretive dancing, and busting out some glow sticks! The exercise will increase blood flow and promote healthy choices. Bottom line, it’s just fun. We live in the desert. So as much as we would love to go outside and burn some energy, sometimes weather just doesn’t permit that. So, we killed two birds with one stone. All you need for this one is a balloon, a clear floor, and a good attitude. Take the balloon and take turns passing it to each other without letting it touch the ground or holding the balloon with your hands. Little ones will need a little more patience because they tend to get excited and grab the balloon, but it’s all part of the fun. Do an additional twist and turn it into a full fledged volleyball game. Split the family into fair teams. One team serves the balloon by hitting it in one shot over a predetermined boundary (we like to use a row of pillows to mark it clearly). Now each side has to work as a team to get the balloon to the opposing team’s side in three hits. If it hits the ground, who ever is not at fault gets a point. For instance, if Team A hits the balloon over the middle and Team B doesn’t catch it before it hits the ground, Team A gets a point. If Team A doesn’t get the balloon over the middle in three hits, Team B gets a point. And so on! First team to 21 wins! Give these activities a try and let us know in the comment how they turned out! Let us know what you did and how you added your own little twist to your family time! As always, thank you for joining us on this journey! P.S. If you would like more tips, tricks, and info like this, click here to check out how you can become a part of our exclusive LGP village!